JERSEY CITY, N.J.—The word “competition” is supposed to mean a contest in which the two sides have a relatively equal chance of winning. The Presidents Cup is anything but. It’s in need of a major overhaul to attain what’s been lacking since the event began in 1994. The final tally: USA 19 points, International team 11 points. The outcome was never in doubt on the final day. 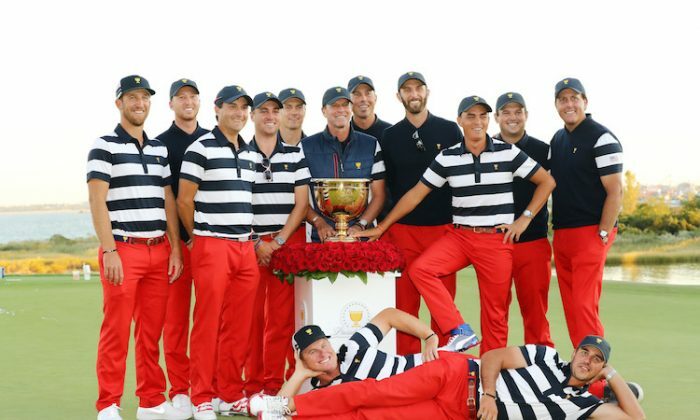 The American squad nearly retained the Cup prior to Sunday’s 12 singles matches, which would have been unprecedented and a resounding embarrassment for the International squad. The loss marked the 10th time the International team has tasted defeat with only one win and one tie to show for its efforts. The American squad has now won seven straight events since 2005. The brainchild for The Presidents Cup is the PGA Tour. The hope at the outset was having an event of comparable stature to the more prestigious Ryder Cup which features USA versus Europe. The PGA Tour wanted it held bi-annually so that it could draw similar attention with the Ryder Cup. Despite that intention, the two events are in far different places—the Ryder Cup being the main event with the Presidents Cup simply a sideshow in need of a major overhaul. Nick Price captained the International team for the third time. Born in South Africa and raised in Zimbabwe, the former number one player in the world and three-time major champion, suffered two previous captain’s defeats. Price was not the only vocal critic of the format. During the press conference following the event, South African Ernie Els, also a former world number one player and four-time major champion, said that the PGA Tour needs to permit the International team to make its own decisions. Els has never captained the International squad and given his reputation, it seems likely he’s on the very short list for the next event. Els left little doubt a thorough discussion would be a plus for all involved. Reducing the total points available from 30 to 28 would mirror the Ryder Cup. That would mean following a format whereby the competition is reduced from four to three days. It would also mean 36-holes of various partner formats the first two days, followed by 12 singles matches to conclude the event. The reduction in points would negate the depth of a youthful and talented American squad augmented by a few seasoned veterans—most notably Phil Mickelson who has played in every Presidents and Ryder Cup since 1994. The reduction in total points would also mean more choices for the respective captains to make given that the partner formats of foursomes and four-balls would have only 8 of the 12 players participating. Given the lack of depth for the Internationals, the reduced number of matches and the wherewithal to lean more on its best players should to give the squad a better opportunity for success. The Internationals should have clear control in how their team is selected and other related matters. That may also mean a new team selection process with half of it determined by points leading up to the event and an equal number of captain picks. Nonetheless, what is clear is that the existing Presidents Cup is lacking a competitive balance. In the late 1970s, Jack Nicklaus suggested to Ryder Cup organizers a shift to include golfers from the continent of Europe joining those from Great Britain and Ireland. The reasoning? The United States was winning on such regular intervals that interest in the event was waning—especially in America. The Nicklaus suggestion paid off quickly. The European juggernaut took hold starting in 1985 with Europe winning 11 times in 16 events. The United States retained the Cup last year in Minnesota. The International squad is comprised of talented players, but the youthful American squad has the likes of Justin Thomas, Jordan Spieth, Rickie Fowler, Brooks Koepka, Dustin Johnson, and Patrick Reed. Given their respective world rankings, it’s likely they will be on the scene for the next decade or so.